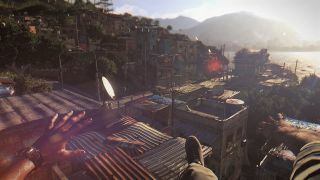 Dying Light was pushed back into early 2015 in order to give Techland more time to polish the game's parkour system. Today the studio offered some insight into what it's been up to with the release of its first development diary video, which looks more closely at how players will use "Natural Movement" to make their way around a city overrun by the risen dead. The movement isn't entirely "natural," of course, unless you happen to be Spider-Man, but it looks fast, smooth and very obviously reminiscent of Mirror's Edge. It appears to be more flexible than Mirror's Edge, too, although how that will actually play out won't be known until we get our hands on it. The most intriguing part of the video comes near the end, with the brief look at what it will be like to move around at night. As you may recall, zombies become much more powerful and dangerous during the night, a problem compounded by the very limited visibility provided by the flashlight. It's a shame the trailer didn't spend a bit more time showing off what happens when the sun goes down, although I suppose that could be fodder for future development diaries. Want to know more? Have a look at our hands-on preview from E3. Dying Light is currently scheduled to launch sometime in February 2015.